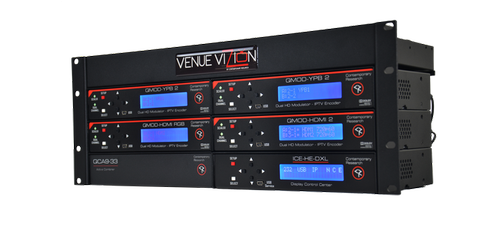 Contemporary Research has combined their core line of products and packaged it into one rack ready unit, the Venue Vizion. This all in one kit combines QMODS, Active Combiners, Display Controllers, with a Head End Display Control Center, to create an amazing 8x20 digital matrix for transmitting RF over Coax. These systems can be custom made and tailored to suit your application whether it be a restaurant, sports bar, transportation hub, or corporate environment. 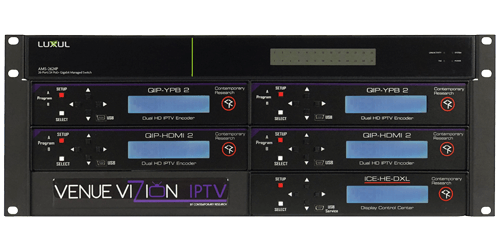 For the best in high quality content distribution and control, the Contemporary Research Venue Vizion is an industry powerhouse for HDTV Distribution. Watch as Matthew Sittloh showcases at Infocomm 2017 the brand new Venue Vizion by Contemporary Research!